The joy of a fine amber ale is the harmony between delicate caramel from the malt and fragrant fruitiness from the hops. This Irish beer is very well-made from that point of view and is loaded with flavor. The malt character is smooth and mellow, supporting orange and floral notes from the hops that waft around on the palate. Is it perhaps a touch too sweet? Maybe, but it’s a minor criticism that’s soon assuaged by the tangy hops in the dry, firmly bitter, robust finish, with lingering citrus peel and pine having the final say. The brewery in Bray is so named because the last wolf in Ireland was seen in the area, and the brewers happily link that to Humulus lupulus, the Latin tag for the hop plant. The beer has an entrancing bright amber color with a frothy collar of foam. 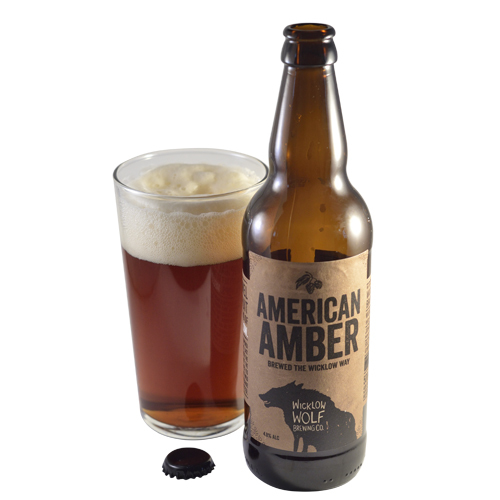 It may be labeled “American Amber,” but this is a traditional Irish red ale with a modern kick from Cascade, Citra and Magnum hops. Pale, crystal and roasted malts create a luscious aroma reminiscent of a bakery at dawn overlain by spicy and floral hops. Bitter hops pile on to the palate, backed by orange, peach and dried apricot, with a continuing hit of fresh-baked bread. The finish is dry and malt-driven, but bitter hops and tangy fruit continue to make an impression.